No one wants mice in their home. A mouse can enter your home through the smallest cracks. They’re eager to find food and will do whatever it takes to eat even the smallest crumb. If you see one mouse in your home, chances are that there are plenty more mice in or around your property. These pests don’t tend to travel alone. So, if you’ve recently found mice in your home, it is important to call the professionals. Serving Andover, Oak Grove, Ham Lake & Blaine, MN, our team at Minnesota Wild Animal Management, Inc., have the tools and experience to humanely remove mice from your home. As a mice exterminator, we’ve seen the damage these animals can do to a home if no action is taken by the homeowner. Some of the damage that we’ve found with other homes that was caused by mice includes wire damage, A/C unit and furnace issues, as well as damage in your attic and insulation. Additionally, these mice can leave behind diseases, parasites and feces. Salmonella and ringworm are issues that we’ve found homeowner’s dealing with due to a mouse invasion. This is why it is so important to pick up the phone and call our mice exterminators at Minnesota Wild Animal Management, Inc., the minute you see the first mouse in your home. Call Our Experts – We have no way of knowing that you’re having issues with mice unless you pick up the phone and give us a call. This is the key step that gets the process going! 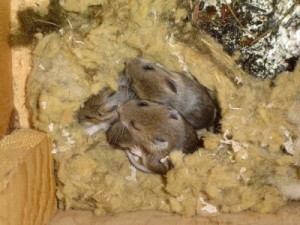 Mice Removal – Our homeowners favorite step is the removal process. We’ll spend however long it takes at your home to make sure that all mice are removed. Damage Repair – Depending on how long the mice were in your house, you may have some damage that needs to be addressed. Lucky for you, Minnesota Wild Animal Management, Inc., can handle the damage repairs as well! Preventative Steps – Last, but not least, we will prevent these unwanted pests from entering your home again in the future. These preventative measures are backed by our four year warranty, which cannot be matched by our competitors. So, if your home in Andover, Oak Grove, Ham Lake or Blaine, MN has been intruded by mice, it is important to call the professionals as soon as possible. As a humane mice exterminator, we will remove these unwanted animals from your home in a timely fashion. To set up an inspection in the near future, give our team at Minnesota Wild Animal Management, Inc., a call today at (612) 237-8282. “A” Rated 5 Time Super Service Award Winner On ANGIES LIST! Copyright © 2019 Minnesota Wild Animal Management, Inc.